When it comes to ELD manufacturers, there are well over 100 companies that are offering a number of devices that you can choose from. 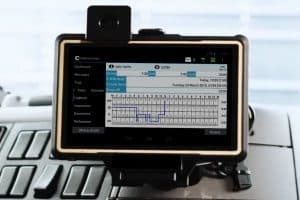 However, whether or not you are able to be compliant with the FMCSA ELD mandate could depend on which device you choose and which ELD manufacturer you go with. In this article, we’re going to focus on what type of device you need to look for, how to know if a manufacturer meets the FMCSA regulations, and give you a list of ELD manufacturers. If you are simply looking for an easier way to log information, then you can choose any device that’s on the market. However, if you want to comply with the new FMCSA regulation which requires all trucks to have an ELD device in place, then you need to make sure that the device you’re looking into actually meets all their requirements. The truth is that there are many devices out there that do not currently meet requirements, even if it’s labeled as an ELD. These devices were introduced in 1988 with the first set of regulations created by FMCSA regarding the use of electronics to monitor commercial vehicle activity. If you have one of these devices, there is a chance that you can continue to use it, especially if it’s a newer model that can have its software updated to meet the new standards. However, you’ll need to check with the manufacturer about your specific device. This type of device is more advanced than the original AOBRD devices and were introduced in the early 2000’s. Up until 2012, this was the preferred device that was up-to-date with the FMCSA regulations at that time. If you have one of these devices, then it may give you more time to comply with the ELD mandate, so check to make sure that your EOBR device qualifies you to wait before needing to install an ELD. This term is considered the official one and was established in 2012 with the creation of the Moving Ahead for Progress in the 21st Century bill that Congress passed which included the ELD mandate. These devices record more than just hours of service or even drive times. They record everything from GPS position to hard braking. ELD devices are the only ones that are compliant with current FMCSA guidelines. In order for an ELD to be compliant with current standards, the ELD manufacturer must confirm that it complies with the technical specifications as laid out by FMCSA by going through a self-certification process. From there, they need to register that device with FMCSA and provide proof that they have certified it themselves. FMSCA does not endorse any particular ELD provider or ELD device, and any device that is found to not match their specifications will be removed from their list. Which ELD Providers are FMCSA-Compliant? When you’re ready to get your fleet fitted with ELD devices so you can continue to be FMCSA-compliant, then you can get started with any one of the ELD providers on our list. Keep in mind that every ELD provider and device is different, but they all perform the same basic functions. If there are specific optional functions that are important to you, then you’ll need to make sure that the ELD device and provider you’re looking at will suite your needs. The other thing you will have to consider when looking at ELD manufacturers are whether they only provide the device or if they also provide services. If you are looking to work with an all-in-one company, then you have to make sure that the ELD manufacturer you choose not only offers the device, but also has monthly services that will work for you. - Global Tracking Communications, Inc.
- Hawk Eye Log Global Technology Ltd.
- Hutch Business Group Inc.
- I.S.P.P. 9675868 Canada Inc.
- J. J. Keller & Associates, Inc.
- Spark Technology Labs Inc.
- Trip Data & Safety Management Inc.
- Yusata Infotech Pvt Ltd. The sooner you get an ELD device installed from one of these ELD providers. The sooner you will be able to reap the benefits of having an ELD device, which includes saving your company money in several different ways. You may have extra time to comply if you already have an AOBRD or EOBR installed. But the sooner you start looking at the ELD providers available to work with, the more time you’ll have to weigh your options carefully to choose the one that’s right for you.